Looking for a lightweight ring you will want to wear all day? 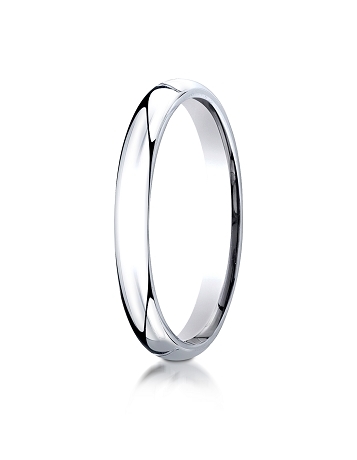 Look no further than our 14k white gold 3mm slightly domed super light comfort fit ring. Whether worn as a fashion statement or a symbol of your commitment, this designer ring offers no shortage of sophistication and class. For many years, precious metals have prevailed as the popular choice for jewelry. Our men’s 14k white gold 3mm slightly domed super light comfort fit ring is a testament. 14k white gold contains approximately 58.3% pure gold by weight and an alloy of palladium, silver, zinc, or nickel for extra durability and heirloom quality. Don’t break the bank for platinum. Get the same slivery hue at an irresistible price by choosing white gold for your next accessory. Our 14k white gold 3mm slightly domed super light comfort fit ring is one of the most comfortable rings available. Best of all, white gold is highly malleable and your ring can be removed in the event of an emergency or resized as your fingers change over time. Comfort fit bands tend to measure a half-size smaller than standard wedding bands. We recommend having your finger measured for a comfort fit ring at your local jewelry store so you can better decide if this ring style is right for you. If you have any questions about our men’s 14k white gold 3mm slightly domed super light comfort fit ring, contact us today for further assistance or additional information.